DeWayne Sutton worked for Tomco Machining in Dayton, Ohio. When he hurt his back while dismantling some equipment, he followed “best practices” and reported the injury immediately to company owner Jim Tomasiak. The boss pulled a “Trump” – deviating 180 degrees from “best practices” by firing Sutton immediately. No reason was given for the termination. As you would expect, Sutton was able to collect comp benefits (termination is no bar to eligibility), but could he also sue for wrongful termination? In other words, was the termination retaliation for reporting the claim? Under the Ohio statute, employers are prohibited from firing, demoting or taking punitive action against an employee who files a workers comp claim. The question at issue is one of timing: the claim had been reported to the employer, but not yet filed with the insurer. So did Tomasiak violate the law by firing Sutton in the interval between the injury and the report to the insurer? We find that the General Assembly did not intend to leave a gap in protection during which time employers are permitted to retaliate against employees who might pursue workers’ compensation benefits. The majority has today expanded the public policy behind the provisions of (state law) to apply to those persons discharged before filing, instituting or pursuing a workers’ compensation claim. This allowance is a legislative prerogative, and in my view, we should follow the law as written and defer to the General Assembly, instead of stretching the extent of protection to fit situations not addressed by the statute. This is familiar territory in the world of law: liberal interpretation (the majority) versus strict construction (the minority). One vote determined the outcome. Business owner Tomasiak comes away with a double whammy: he is liable for the comp claim through the experience rating process; having fired Sutton, he is unable to lower the cost of the claim by bringing Sutton back to work on modified duty. Then he faces a wrongful termination lawsuit, which he is probably going to lose. The timing of his action, along with the absence of any stated rationale, reak of retaliation. Tomasiak’s impulsive response to Sutton’s injury violated Rule Number One for employers: if employees are not working out, fire them before they get hurt. Once they are injured, comp laws pretty much assume that any firing would be retaliation. For Tomasiak, just trying to run his machine shop in Dayton, Ohio, this is a tough – and expensive – lesson in best practices. It’s Health Wonk review week, and Minna Jung serves up the March Madness of both the basketball court and the health care reform process in this week’s Health Wonk Review. Visit this week’s post at the Robert Wood Johnson Foundation’s blog The Users’ Guide to the Health Reform Galaxy. Laura Petrecca of USA Today writes that employers are increasingly using technology to track and monitor employees. They do so for a variety of reasons, including monitoring to ensure productivity; to ensure that trade secrets are protected, and to ensure maintenance of professional and lawsuit-proof workplaces. Next month, the U.S. Supreme Court will hear a case that will explore privacy rights for employees when using employer-supplied devices. View some of the tech monitoring techniques that are being used. NPR has been running a series on work-life balance and the increasing number of employers who are turning to flexible work schedules. You can read more about it at HR Web Cafe: Work-Life Balance and Flex Work. Employee compensation costs – Private industry employers spent an average of $27.42 per hour worked for total employee compensation in December 2009 (PDF), according to a report issued last week by the Bureau of Labor Statistics. Wages and salaries accounted for 70.8% of these costs, while benefits accounted for 29.2%. Of the benefits, 8.2% were for the cost of legally mandated benefits. Immigrant workers – In light of a recent Iowa Supreme Court ruling in a case involving a nonresident alien, Roberto Ceniceros posts about immigrant workers and benefit complexities. To stay current on other related issues, we refer you to Peter Rousmaniere’s Working Immigrants. “A decision to wait for liquidation or settle beforehand should depend on a cost benefit analysis that includes evaluating whether state guaranty funds for workers compensation claims are likely to pay for the majority of a policyholder’s claims, several experts said. Workers comp claims account for the largest portion of Kemper’s outstanding liabilities, totaling about $600 million, Ms. Veed said. 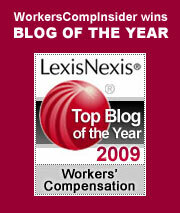 Can You Terminate an Employee on Workers Comp? Here’s a question that comes up frequently in our employer seminars: can you terminate an employee who is on workers comp? In general, it’s not a good idea. In many states there is a presumption that the termination is in retaliation for filing the comp claim. Nonetheless, the complete answer to the question is yes, you can, but you must do it very carefully. The invaluable Risk and Insurance Magazine describes a case in Texas that illustrates this point nicely (Williams v AT & T, U.S.District Court, Southern Texas). Williams, a telecommunications tech, alleged that he sprained his leg stepping down from a ladder. He was a bit confused about the exact date, offering more than one in his descriptions of the incident. His claim was denied. One month later, he violated an important company policy and was suspended and then terminated. Even though his comp claim was denied, he alleged that he was terminated in retaliation for filing the claim. He sued AT & T for violating the Texas comp act. Keep in mind, the employer must be able to demonstrate that the termination had nothing to do with the (denied) claim. In this situation, the burden of proof is definitely on the employer. AT & T presented evidence that Williams had a history of poor performance and excessive disciplinary actions for more than a year prior to the alleged injury. In other words, two key criteria of proof were met: the disciplinary problems preceeded the workers comp incident and they were thoroughly documented. The court granted summary judgment to the employer. While falling under the protected class of employees who have filed comp claims, Williams could not establish that his termination was related to the comp claim. There were plenty of other reasons for the employer’s actions. I often hear employers complain that they had been planning to terminate a marginal employee, but then the employee got hurt. In most cases, there is inadequate documentation of poor performance prior to the injury. These employers are stuck: any attempt to document performance issues after the injury will be viewed sceptically by the court. The termination will trigger retaliation claims.